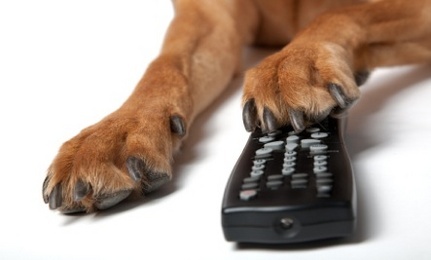 Extraordinary Dogs: Do We Really Want A Generation Of Couch Potato Dogs? Do We Really Want A Generation Of Couch Potato Dogs? We often park children in front of electronics at home or in a restaurant. It looks like we can do the same with our pets. DogTV will cost subscribers $5.99 a month to broadcast content 24hrs a day, 7 days a week, to capture the attention of our dogs. The company describes the channel as “scenes with and without other animals, animation sequences and a variety of moving objects.” There will also be relaxation segments which will show sleeping dogs and nature scenes, while playing soothing music. 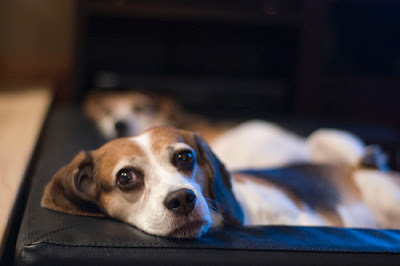 Home Alone: Studies have shown that dogs left at home alone, while their humans are at work, do better when the TV is left on. 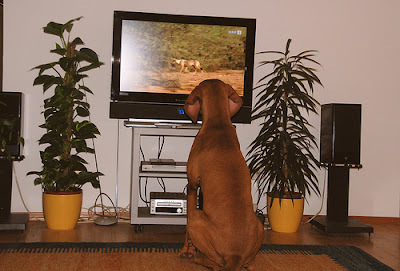 The content on DogTV was developed scientifically, using research groups, and with input from dog trainers, and is designed to prevent anxiety, depression and boredom. When dogs are left alone they often become anxious, and that’s when they tear things up. The programming provides dogs with segments meant to stimulate and invigorate them, as well as segments to calm and relax them. The stimulation segments show dogs running, frisking around, and surfing. The hope is that it will encourage the dog watching the show to get up and move around in excitement. There are also segments designed to expose dogs to things they need help getting used to. Images of other dogs help socialize them, other sounds and images like traffic sounds, doorbells, babies and children, and other animals are all included to help get your dogs accustomed to those things. DogTV is recognized by the Humane Society of the United States for improving the quality of dogs’ lives. Dogs that are made to feel confident and happy when they have to be left alone are less likely to be stressed, or have separation anxiety. These programs were created specifically for dog’s vision and hearing, and their behaviour patterns. Filmmakers had fun making the segments, getting down on the ground to shoot from Dog Point Of View. Editors worked with the film to tone down the colours, cut high frequency sounds, and add music. Dogs can see the colours blue and yellow, but not red or green. Past research on dogs shows that they could only see a flickering screen on old analogue televisions. Newer technology allows dogs to see images as long as they are the right colours. There are no plans to run commercials on the channel, and new content will be added all the time. Remote Control Wars: If your dog wants to watch his “stories” while you’re home, and you don’t want to give up control of the remote to your hound, you can stream the programming to a computer for $9.99 a month.